If you find yourself in the beautiful blue city of Jodhpur, India, then you'll be spoilt for choice with hotels. Discover the best hotels in Jodhpur below. 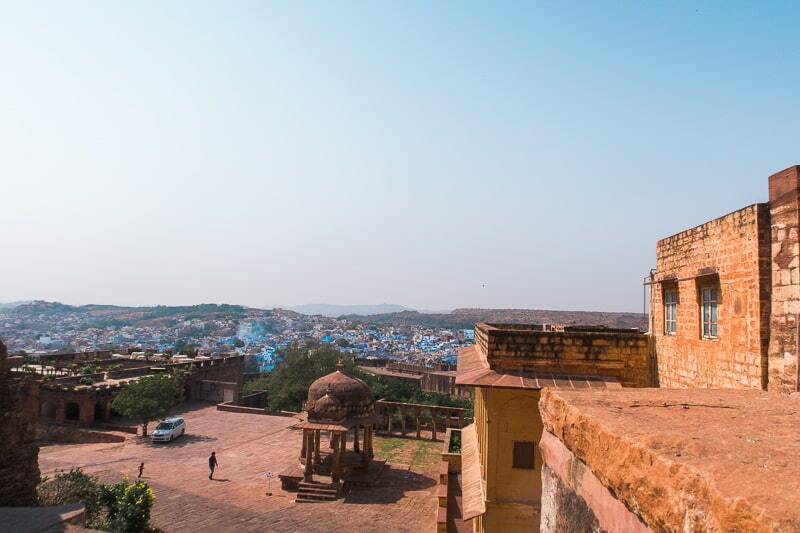 Bradley and I visited the beautiful blue city of Jodhpur during our three weeks in India. It was truly one of my favourite places. Full of culture, delight, and blue buildings! The view of the fort, towering over the city and lit up at night is one of the most amazing sights I’ve had on my travels. Jodhpur is full of amazing places to stay, and we before we booked, I did a lot of research on the type of accommodation I wanted. So, I knew I wanted a nice hotel with a beautiful view of the fort, and that’s what I found. The first property I will mention on my list of the best hotels in Jodhpur for couples is the hotel we choose, and the rest are properties I debated over. 2 of them are super famous in Jodhpur and way out of my price range, but it may be the perfect spot for you! So keep reading to find your perfect hotel in Jodhpur for a memorable stay. It won’t cost you anything more booking through a link we have provided! When you think of travelling or visiting India, your mind automatically goes to the Taj Mahal, and perhaps Jaipur. 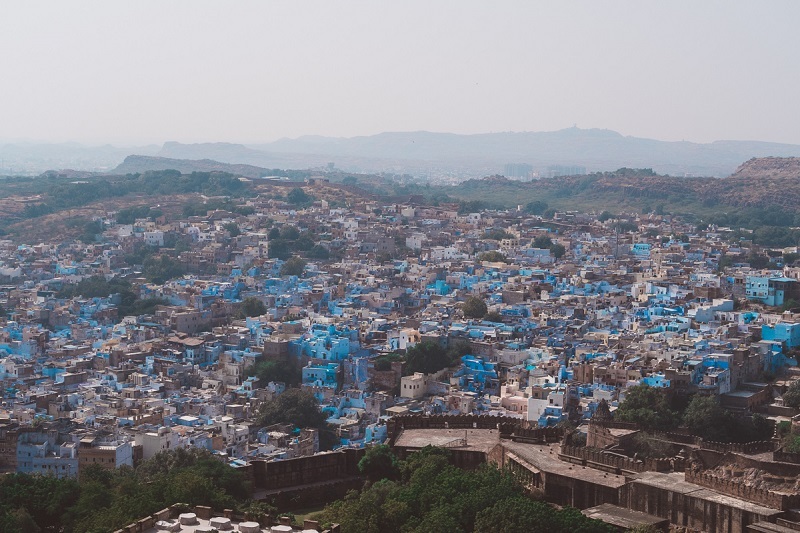 Not many people think of the blue city, Jodhpur. I’ll be honest and tell you I never knew much about Jodhpur before I researched my India travel itinerary. But this place is bursting with great food, friendly locals and lots to see and do. Batman fans (Christian Bale era) will be pleased that one of the iconic scenes is filmed at the famous fort in Jodhpur. I’ll not tell you, maybe you’ll recognise and remember! But from learning new history, seeing beautiful sights, and fantastic day tips, a trip to Jodhpur will leave you with fond memories. The peak tourist season in India is their winter, which is our winter in the UK too, so that’s October to January. We visited in November and the weather was pleasant, and we didn’t experience any rain. I guess because it’s peak season, prices may be higher, but since India is such good value in general, I can’t say I noticed any difference. How long should I stay in Jodhpur? 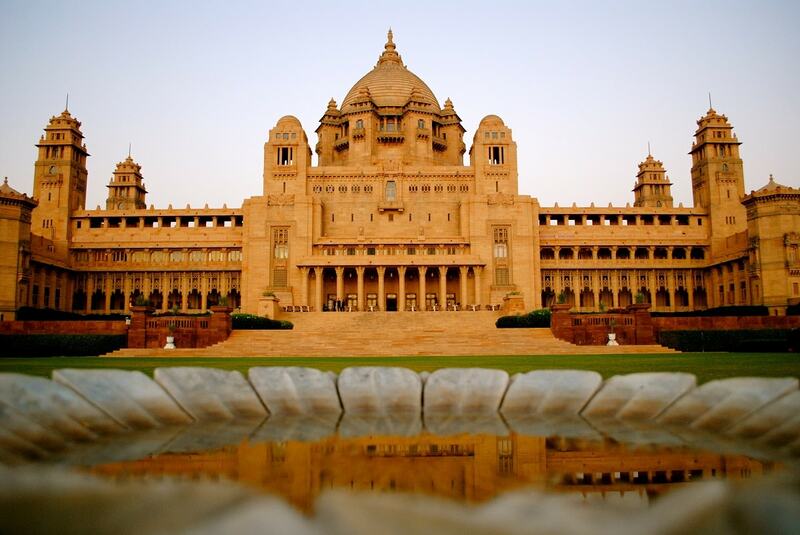 To get the most out of Jodhpur and its surrounding areas, I would recommend 2 to 3 nights. No less than that. I think 3 nights is more acceptable if you want to rent a moped or car and take some solo adventures. Okay, now for the part you came for: the best hotels in Jodhpur for couples. These hotels are based on my research and where I stayed. Because they are chosen for couples, they all include double beds with private bathrooms, and air conditioning as standard. This is the property that Bradley and I stayed in during our time in Jodhpur. The rooms are beautifully decorated. In a sort of Moroccan/Indian style. The bed is super comfy, I love the bathroom,the shower and cute little windows. The WiFi is fast (important for digital nomads like us! ), the staff are super friendly and amazing, the cafe is on the rooftop and it feels like you could reach out and touch the fort, you are that close. In the evening when the fort is lit up, the view is unbelievable and it’s the perfect dinner setting. Food is reasonably priced and the food is good, not great, but good. The staff are very friendly and you get little candles at your dinner table as you dine. It’s classed as a homestay, but it feels like a hotel and is run like a hotel. If you get a tuk tuk (which is the only thing that will fit down the road to get to the hotel), two members of staff will come help you with your bags as the hotel is located up a steep set of stairs (hence the amazing view). They don’t pressure you for a tip, but it’s always polite to tip! Card is accepted at this property. This place is great value and you can find the latest prices here. I remember researching this place and loving the Indian authenticity and charm it excludes with a touch of modern design. It’s a stunning 5 star resort which features a variety of sleeping options. From luxury rooms, to suites and even luxury tents (which look amazing), there is something to suit everyone. The hotel features a gym, beautiful outdoor pool, an open air restaurant, WiFi and spa. Guest can even enjoy a desert safari, or a drive in a vintage car or a village safari. A 3 star hotel with a fantastic view of the fort, traditional styled rooms, great staff and a great price. This is one of my favourite hotels in Jodhpur for couples and it was in my top 3 choices for Brad and I before I booked. There is a rooftop restaurant that offers amazing views of the fort (you’re only 450m away!) There are a variety of different room types available too. For the latest prices click here. This is another homestay styled hotel with beautifully decorated rooms, and a fantastic view of the fort. It again offers an on-site restaurant which means romantic meals by candlelight and the most perfect view. It’s only 200 yards from the fort. There are a variety of different suites available for a relaxing stay. Card is accepted by this property. Find the latest prices for this beautiful boutique homestay here. Another fantastic hotel in Jodhpur for couples is this homestay/hotel. Again, the rooms are beautifully decorated and offer authentic design. There is an on-site restaurant and a terrace to enjoy views of the fort. WiFi is available and there are a variety of different rooms for different budgets, so there is surely something to suit everyone! Find out the latest prices here. A 5 star hotel that oozes beauty, luxury and ease. This is one of the most beautiful hotels I have ever seen and it’s in a perfect location. As you are swimming you get a view of the fort, imagine that at night. Beautiful! This hotel includes everything you would expect from a 5 star resort, spa services, luxury rooms, on-site restaurant and much more. It will certainly be a memorable stay. The property does accept card. Well, this is actually the most famous hotel in Jodhpur, and one of the most famous in India. 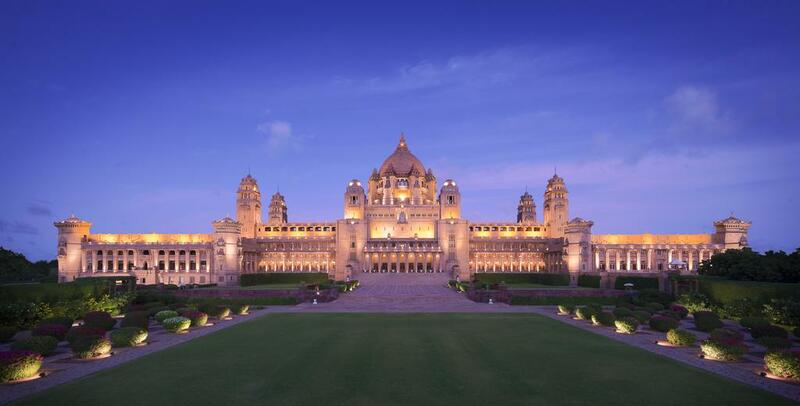 It’s luxury done at its best, and you are literally staying in a palace. It is unbelievable. You get celebrity treatment from arrival to departure. Exquisite rooms, on-site bar and restaurant, a champagne museum, beautiful gardens and surroundings, this is a hotel experience like no other. With prices start at $500 per night raising up to the thousands depending on your suite, it’s definitely a pricey selection. But read the reviews and you’ll see what you’re in for, plus a 9.7 review score on average is pretty damn amazing! This property accepts card payments. Find the latest prices here. Hotels by the Taj Brand are always oozing luxury and a world class celebrity experience, and this one is no different. It’s a 5 star resort with everything luxury about it. Bathrooms have massage showers and a bathtub. The resort has an outdoor pool, on-site gym, spa services, restaurant and much more. At just $300 a night for a 5 star resort, this place sells out really quick! It’s no wonder it’s one of the best hotels in Jodhpur for couples at that price. The hotel accepts card payments. Get the latest prices here. A 3 star hotel perfect for couples. It’s beautiful decorated, has an on-site pool, perfect for relaxing after a day of sightseeing and it was built in 1920 making it an architectural marvel. This heritage hotel has a variety of rooms available to suit a variety of budgets and it often sells out quick. It’s got an on-site restaurant serving delicious authentic Indian cuisine and the staff will do everything they can to ensure a memorable and comfortable stay. The property accepts card payments. Rooms start at just $30 a night for this 2 star hotel making it excellent value for money for those couples on a budget, or who simply like a fantastic deal! It’s got beautifully decorated and comfortable rooms, a fantastic view of the fort, it’s a blue building (making for wonderful pictures) and it’s got an on-site restaurant for delicious food. Suites are also available for a great price if you fancy a little extra luxury during your stay. Card payment is accepted at the property. Find the latest great deals here. This is a beautiful 3 star heritage hotel that I think is great for couples. It’s got an authentic wholesome feel to it and it’s beautifully decorated. There is a large outdoor pool for relaxing and cooling off from the heat of Jodhpur. There is an in-house restaurant for delicious dining and you can arrange car rental from the property. I think it’s great value for the location and amenities offered, but you can decide for yourself here. I love a Radisson hotel, and we stayed in a fantastic Radisson with a view of the Taj Mahal for a great price. But when it comes to a stay with the Radisson, you know you’re getting luxury at a great price. This hotel is no different. The building itself is amazing, an architectural delight. The rooms are stunning, many with beautiful bathtubs. There is an on-site gym, spa access, a great outdoor swimming pool. You can also book airport transfers (both ways) when booking for extra convenience. Find the latest great deals here for the Radisson. I hope you like my list of the best hotels in Jodhpur for couples and hopefully you’ve found something that inspire your stay. But, if none of these properties take your fancy, you can search all hotels in Jodhpur here. As I have mentioned before Jodhpur is filled with amazing things to do and see. 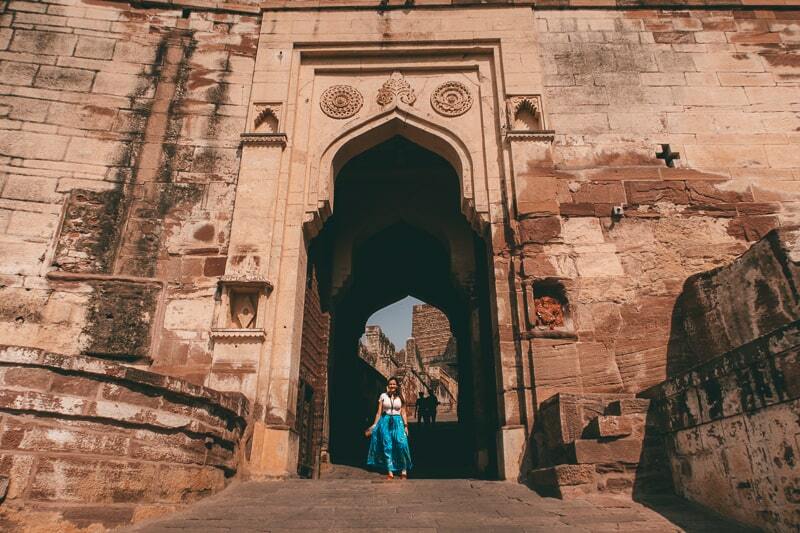 I’ve actually written a whole guys on 17 things to do in Jodhpur in 2 days (yes, 17!). But I will highlight some of my favourites here too. This is the most iconic thing to do in Jodhpur, simply because it towers over the blue city and is packed with culture, beauty and history. As standard with your ticket you get an audio guide (in a variety of languages), which gives you great insight into the history of the fort. There are also some beautiful views to be had here! And, for the more adventurous, you can zipline through the fort. This is one of the most beautiful places in Jodhpur, and as you’ll have seen from above, you can stay in it (not cheap!). But, if you don’t want to stay, you can still visit the palace and its surroundings and see the museum. Chances are if you choose one of the hotels above, they’ll have an on-site restaurant that will deliver on just this. It’s SO romantic. 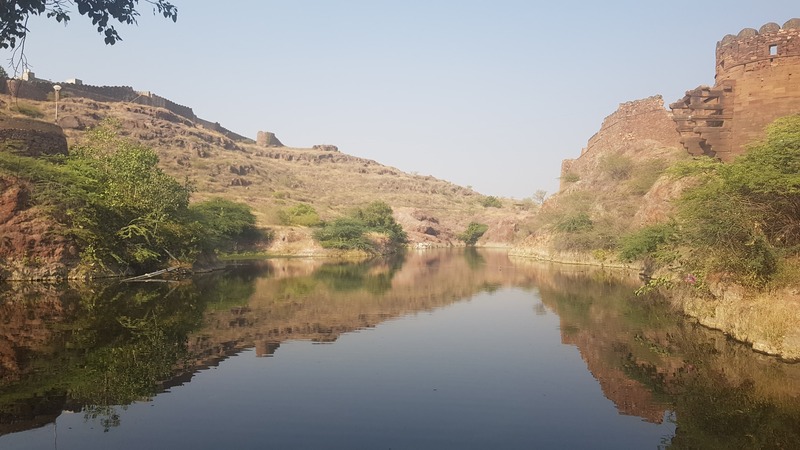 There are a variety of lakes to visit in Jodhpur, and it’s fun asking locals to direct you as they will love the chat and try work on their English. Indian people are very real and authentic and you never feel like you’re being ripped off or hassled. So that’s 4 of 17, don’t forget to check out the post for more ideas on things to do in Jodhpur. 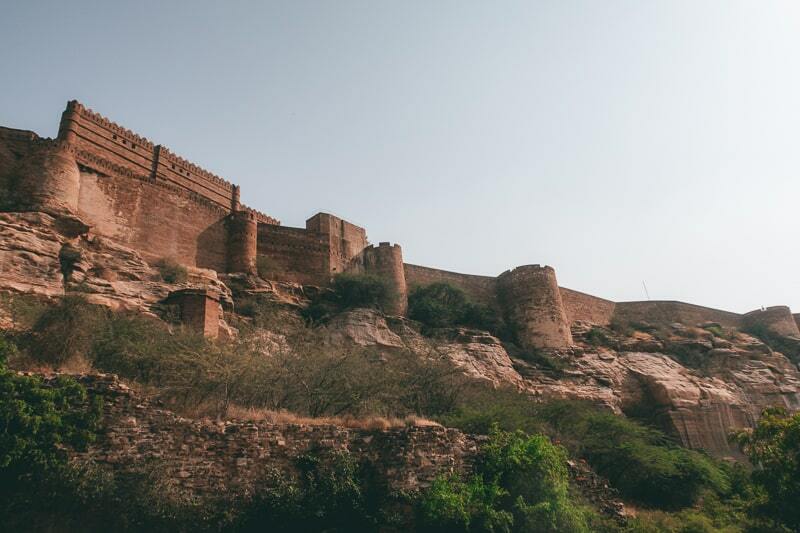 After your visit to the amazing Jodhpur, you’ve got a few options for onward travel. You could visit Udaipur for it’s fantastic palace and amazing lakes, or you could head to the cultural capital of Pushkar for a religious blessing and countryside surroundings. I’ve also done a guide on the best hotels in Pushkar if you need help finding accommodation there. Wherever you choose, you’re going to have an amazing time. When travelling India, it’s important to have an open mind and embrace everything from the food, culture and people! 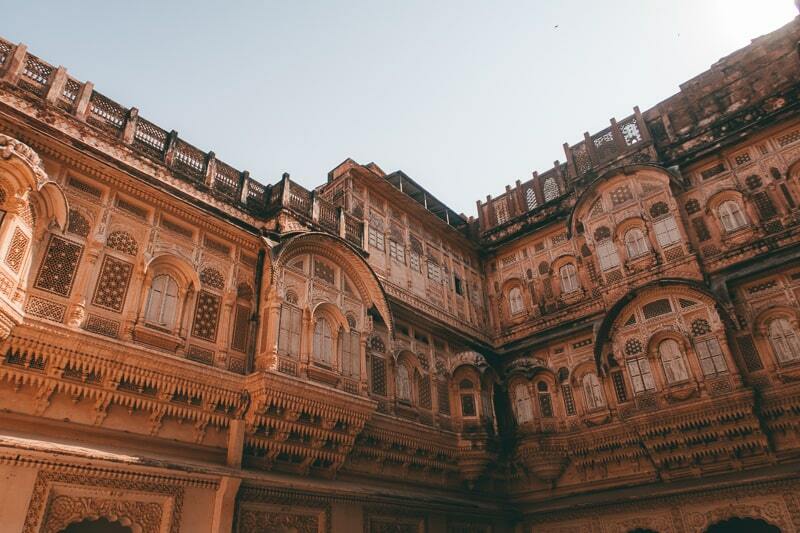 I hope you’ve enjoyed this post on the best hotels in Jodhpur for couples, and hopefully you’ll be one step closer to finding the perfect accommodation in Jodhpur for you and your partner! Wherever you stay, I hope you have a fantastic time. Happy travelling! Want great tours in Jodphur?